I’m getting straight to the point. When people say smoking cigarettes calms them, that’s simply a synonym for addiction. Cigarettes are stimulants; nothing in them calms your body. 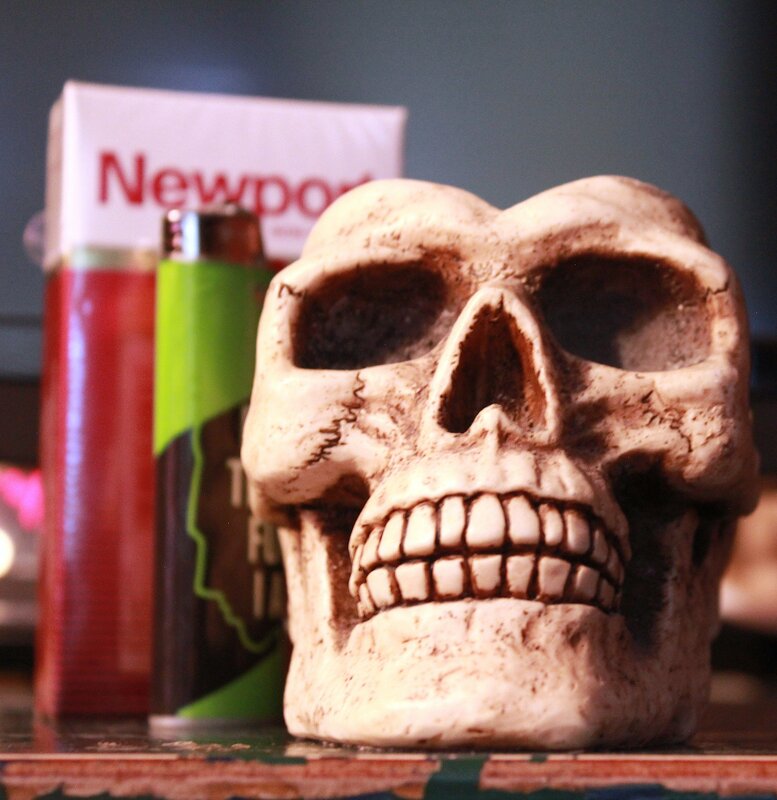 When you begin smoking, you’re on a slippery slope that only goes downhill. Smoking doesn’t make anyone look cool nor does it increase social status. I don’t understand why people romanticize it. From experience, nothing good comes out of smoking. All you have is a craving that costs you hundreds of dollars a month and a body that’s beginning to fall apart. The first puff of your cigarette is the most damaging. The flame and cigarette form a strong cocktail that can leave the mucus lining of your nose damaged. You begin to age prematurely. Wrinkles form around your lips, and your lips begin to darken due to the tar. Inside your mouth, the smoke coats the enamel on your teeth, staining them. It’s incredibly hard to reverse that effect, so say goodbye to pearly a white smile. The smoke deadens your taste buds and salivary glands making for lack of saliva. I don’t think having a dry mouth for the rest of your life is very comfortable. It also causes bad breath. Tar and chemicals coat the roof of your mouth. Whitish residue with red spots begin to form. Those are the opening of ducts of glands present on the palate. Did you know cavities are an outcome of smoking? Along with blackened gums and mouth cancer? I bet you won’t ever smile again. When smoke enters your mouth, it deadens the vessel and cell linings in the back of your throat. They’ll dry out and cause an itchy feeling in the back of your throat that never goes away. The chemicals attack your vocal chords, thus forming a raspy voice we hear on the commercials about former smokers. Throat cancer is pretty common. When the smoke deadens cells in your body, mutilations can occur. When they do, your cells don’t regenerate the way they’re supposed to, which causes cancer overtime. Smoke attacks the cleaning mechanism of the respiratory system, eventually killing everything that’s supposed to protect the inside of your lungs from foreign things. From this stems the nasty smokers cough. Tar buildups within your lungs. Isn’t that gross? From the moment you start smoking, tar builds up in your lungs and doesn’t generally go away. It causes breathlessness, wheezing and fatigue. Cigarette smoke also contains carbon monoxide. That’s a potentially lethal gas since it attaches itself in your blood and doesn’t allow the flow of oxygen to other organs. Inhaling too much of the gas is not only the beginning of cancer, but it also starts the decaying process of your organs, which starts at your mouth to your brain and eventually your kidneys, liver, digestive system and blood. When you exhale, the entire process is repeated, and all the chemicals and tar deposited in your airway is doubled. You lose bone density over time. It leads to osteoporosis and loss of teeth. Your body loses antioxidants causing your skin to wrinkle and stain your fingers and nails. Nothing good comes out of smoking. Your body is rotting on the inside while you age 40 years too early. When you become dependent on the tobacco, I know it’s hard to stop, but what happens when you do is amazing. Within 20 minutes, your heart rate lowers to a normal level. After two hours your heart rate and blood pressure will be close to normal again. Your blood circulation will improve, and the tips of your toes and fingers might feel warm. In 12 hours, carbon monoxide levels begin to drop, causing oxygen to reach your organs, and 24 hours after you quit, your risk for heart disease decreases along with the risk of having a heart attack. Within 48 hours, your nerve endings will begin to regrow, and your ability to taste and smell will increase. In three days the nicotine is out of your system and withdrawals begin to occur. Depression, headaches, nausea, etc. are some symptoms. Don’t crawl back to those cancer sticks. Use the money you were going to spend on a pack on something nice for yourself. Withdrawal symptoms will begin to end within two weeks. In nine months your lungs will get stronger, and your body will begin to fight off infections normally. In one year of not smoking you cut your risk for heart disease more than 50 percent. After five years your blood vessels stop contracting, and your risk of a stroke is that of a nonsmoker. After 10 years the risk of lung cancer decreases at least 50 percent. Smoking claims 90 percent of lung cancer deaths worldwide. After 15 years your risk for heart disease will be that of a nonsmoker, and any long term symptoms reduce to normal levels. Nonsmokers typically live 10 years longer than those who smoke. In the long run, you’ll thank yourself for quitting. Quit while you can. Quit before cancer catches up to you. The next time you pick up a cigarette, think about what you’re doing to your appearance, and how dark and mushy the inside of your body is becoming. It’s a struggle to quit. For only two weeks you’ll agonize through the withdrawls, but for years to come you’ll suffer the deathly consequences of cigarettes.